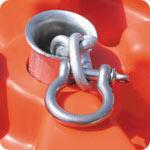 Boatersland Marine > Anchor/Docking > Anchors > Anchor Accessories > Dock Edge 90030F Chain Collar, Fits 1-7/8" dia. Dock Edge 90030F Chain Collar, Fits 1-7/8" dia. Flared Galvalume collar prevents chain wear or chaffing. One piece, weld-free and corrosion resistant. Rely on it to last and last. Fits 1-7/8" dia. (2" nominal) collar/spindle openings. Galvalume has 10X the corrosion resistance of hot-dipped galvanized steel.